The Wharton School is one of the greatest centres of excellence in the world. It trains young people to anticipate the future. It equips them to cope with emerging challenges. I, therefore, greatly value this Medal. America is a land of enterprise. America believes in competition and achievement. Americans value creation of wealth. This medal is a recognition that an Indian can also do it. That Indians are not afraid of competition. That heavy odds do not deter them. It proclaims to the world that Indians are achievers. I accept the Wharton Dean's Medal in that spirit with great humility. I accept this Medal on behalf of my family: The Reliance Family. This is truly a large family. Thousands of workers. Managers, business associates and millions of shareholders. On behalf of every member of this family, I thank you. I dedicate this honour to them. At our Jamnagar site, at this very moment, over 80,000 members of this family are battling. They are repairing the devastation caused by the cyclone. They are confident of restoring normalcy within seven days. It will be a world record, indeed. I am proud of them. To everyone of you, my sincere gratitude. For being here this evening. For your affection and friendship. Between my past, the present and the future there is one common factor: relationship and trust. This is the source of my strength. This is why I could dream when the night was dark. I could laugh when adversity knocked on the doors. I could continue to climb when the peak was so far. When the road was steep and thorny. We are what we are, because, you had faith in us. Because, our people had faith in us. Because, India had faith in us. My achievements are due to all who gave me their trust and friendship with a large heart. American pioneers remain an inspiring example of grit and determination. They laid the foundation of the richest nation on earth. They gave immense respect to the creation of wealth. Indian ethos is no different. On Diwali, the beginning of our new year, we pay homage to Laxmi, the goddess of wealth. Unfortunately, we lost the profound meaning of this ceremony when we lost our freedom. Bureaucracy then became the most respected institution. We became free 50 years ago. But the mindset remained the same. Fortunately, big changes are taking place now. It gives rise to hope for our country as it enters the 21st century. This evening is a proof of that change. During the past 20 years, I have been part of an exciting process. It has created wealth for over 5 million Indian families. I call this the Reliance process. It has brought prosperity and well being to millions of men and women. It has brought dramatic improvement in the quality of their lives. It is this feeling that gives me the greatest satisfaction. But, we cannot rest. We have to enlarge this process many times over. Not five, but five hundred million people should be helped to create wealth and gain prosperity. Our dreams have to be bigger. Our ambitions higher. Our commitment deeper. And our efforts greater. This is my dream for Reliance. In fact, it is my dream for India. This dream can be realised, if all of us place trust in our people. If we remove the bottlenecks from their path. If we foster initiative. If we nurture our human capital. And if we harness our natural resources. You gave me credit for what we have achieved. I am grateful of your generosity. But if one Dhirubhai can do so much, just think what a thousand Dhirubhais can do for this country. There are easily a thousand Dhirubhais, if not more. I firmly, and sincerely believe in this. They are raring to join the race. Compete with the world. And make India an economic superpower. All we have to do is to remove the road blocks. After all, this is a country of nearly a billion people. A vast majority of them are young. I recall my younger days, when I meet them. Give the youth a proper environment. Motivate them. Extend them the support they need. Each one of them has infinite source of energy. They will deliver. To them, I have only one advice: Do not accept defeat. Challenge the negative forces. The past will give in. You will certainly win. For, you represent the future. You will succeed, my friends, because India is no longer in the feudal age. Here is the son of a school teacher from the remote Indian village receiving this Medal. Pedigree is no longer of any significance in democratic India. It is performance that is crucial. You, my young friends are caught between two worlds. Believe me, the world that troubled you is dying. A new India is taking birth. Hope is your most powerful weapon. Self- confidence is your greatest asset. True, the old mindset still hangs heavily. But, these clouds will soon disappear. Ambition and initiative will triumph. We have with us, this evening, a galaxy of eminent people from all walks of life. They represent the leadership of this great country. Many of you have changed the way India thinks. You have the power and responsibility of shaping politics, public opinion, business and intellectual life of our society. The younger generation, the future of India, is watching all of us. With hope and expectation. They cannot wait endlessly for India to join the ranks of developed nations. We must move with greater speed. India should become an economic superpower in the next 25 years. This can be done. Because, three sweeping changes are taking place in Indian society simultaneously. Empowerment of ordinary people is becoming a reality. This makes our times very exciting. From this revolution will emerge a resurgent India. India has every reason to aspire high. No one should grudge us this ambition. We have to break the shackles that chain the energies of our people. We have to place millions of Indians at the centre of our thoughts, wherever we are; in business, in government or in any other field. To make this dream a reality. With determination. Without compromise. And results will follow. Thus, we will build a great India. India that will add to the human happiness and global prosperity. This will make our grand-children proud of us. 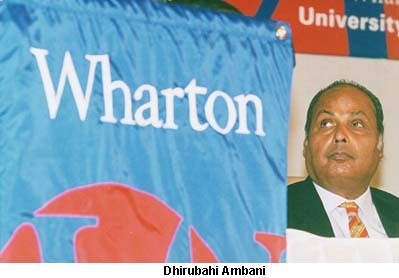 Reliance Industries Limited Chairman Dhirubhai H Ambani delivered this speech when accepting the Wharton School Dean Medal on Monday, June 15.